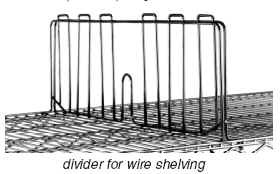 Performance and Quality are the Trademarks of Eagle Wire Shelving. Step up to greater organization, higher capacities, durable wire shelf construction, and longer lasting exterior finishes with Eagle Wire Shelving. We've never had to apologize for our quality! Maximize not Apologize! !